CAREY, Joseph Maull, (father of Robert Davis Carey), a Delegate from the Territory of Wyoming and a Senator from Wyoming; born in Milton, Sussex County, Del., January 19, 1845; attended the common schools, Fort Edward Collegiate Institute, and Union College, New York; graduated from the law department of the University of Pennsylvania at Philadelphia in 1864; admitted to the bar in 1867 and commenced practice in Philadelphia; United States attorney for the Territory of Wyoming upon its organization 1869-1871; associate justice of the supreme court of the Territory of Wyoming 1871-1876; retired from the bench and engaged in the cattle and ranching business; member of the United States Centennial Commission 1872-1876; member of the Republican National Committee 1876-1897; mayor of Cheyenne, Wyo., 1881-1885; elected as a Republican to the Forty-ninth, Fiftieth, and Fifty-first Congresses and served from March 4, 1885, until July 10, 1890, when the Territory became a State; elected as a Republican to the United States Senate and served from November 15, 1890, until March 3, 1895; unsuccessful candidate in 1895 for reelection; chairman, Committee on Education and Labor (Fifty-second Congress); resumed the practice of law in Cheyenne, Wyo. 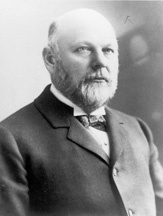 ; Governor of Wyoming 1911-1915; one of the organizers of the Progressive Party in 1912; vice president of the Federal Land Bank; member of the board of trustees of the University of Wyoming at Laramie; died in Cheyenne, Wyo., February 5, 1924; interment in Lakeview Cemetery. American National Biography; Dictionary of American Biography; Peters, Betsy R. Joseph M. Carey and The Progressive Movement in Wyoming.' Ph.D. dissertation, University of Wyoming, 1971.